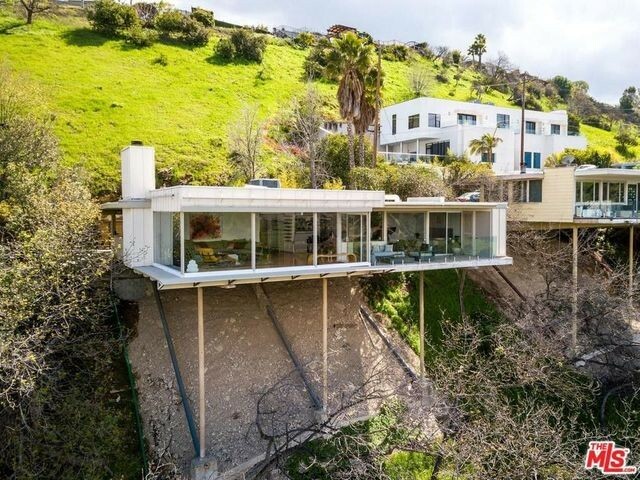 If you’re at all an architecture enthusiast, there’s a good chance you’re familiar with the iconic images of those Southern California stilt homes that seem to dangle precariously over a cliff. 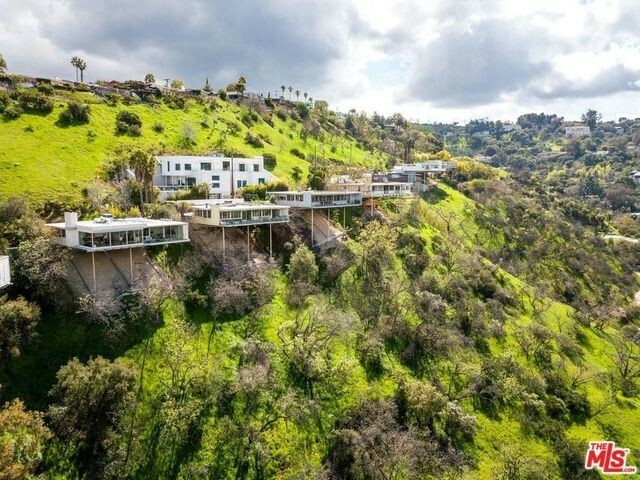 But what you might not know is that those midcentury moderns make up a 17-house enclave built by none other than rock star architect Richard Neutra, And now one of those homes—perched at the summit of a canyon in Sherman Oaks, CA—is on the market for $1.55 million. Of course, the first question most people ask is a fair one: How do the homes stay up? And what would happen during an earthquake? 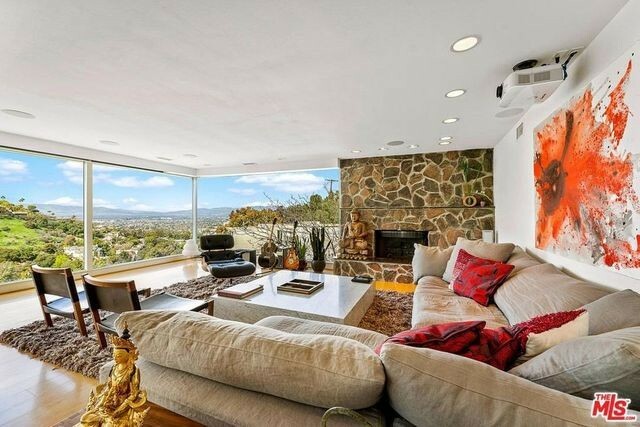 The answer, according to listing agent Michelle Schwartz of The Agency, is that those homes have survived seven major earthquakes since they were built in 1966. 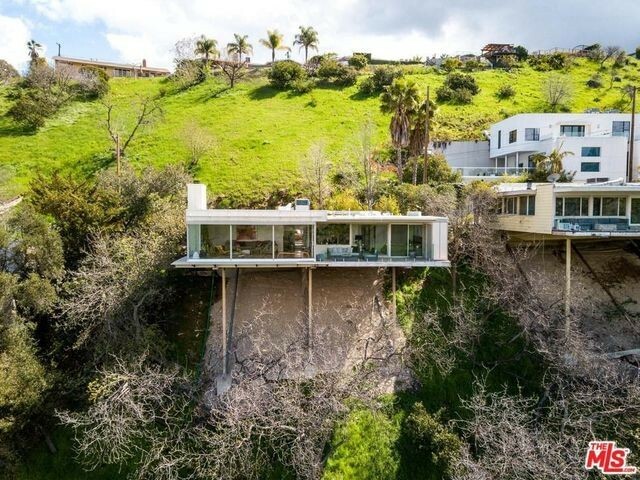 And this house, in particular, was reinforced again after the 1994 Northridge quake, which measured 6.7 on the Richter scale. “The hillside it’s built on is solid bedrock, and that also makes it impervious to landslides,” Schwartz says. Quite apart from being structurally sound, the home has plenty of other features to boast of, such as floor-to-ceiling windows that give the impression that the home is virtually floating on air. 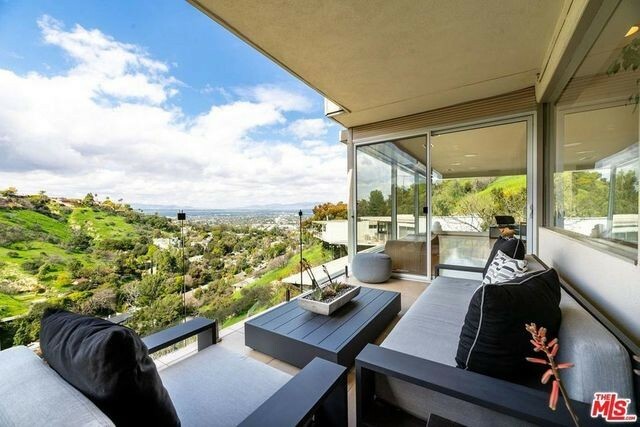 What’s more: The transparent glass balcony railings make you feel as if there’s nothing between you and the open sky. Sipping your morning coffee out there could easily leave you feeling that you’re at a cafe in the clouds—especially when there’s fog in the valley below. 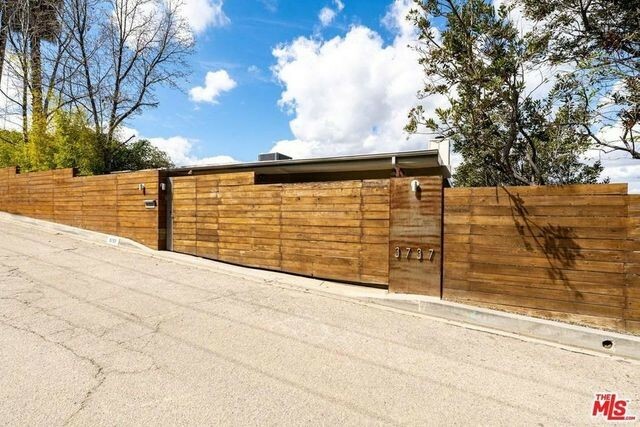 The current owner has only been there a couple of years—he bought the two-bedroom, two-bathroom home in 2017 for $1,310,000. He’s added some state-of-the-art, high-tech features to the place since then. 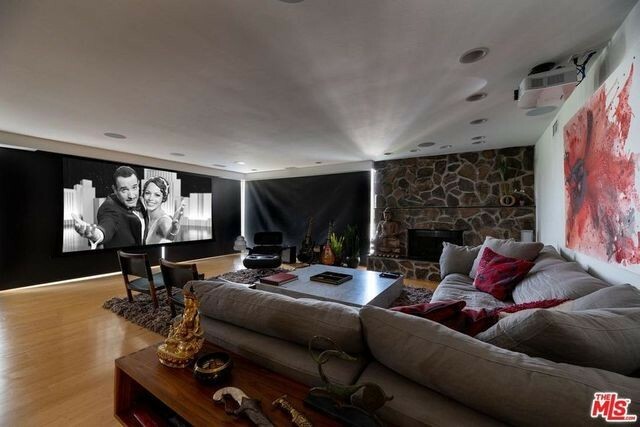 He made it a smart house with Control 4 technology, and added a Sonos surround-sound system, automatic drop-down blackout shades, a drop-down screen and a high-end projector, so that at a flick of a switch, the open living room can be converted into a first-class home theater. The living room converts into a home theater almost instantly. 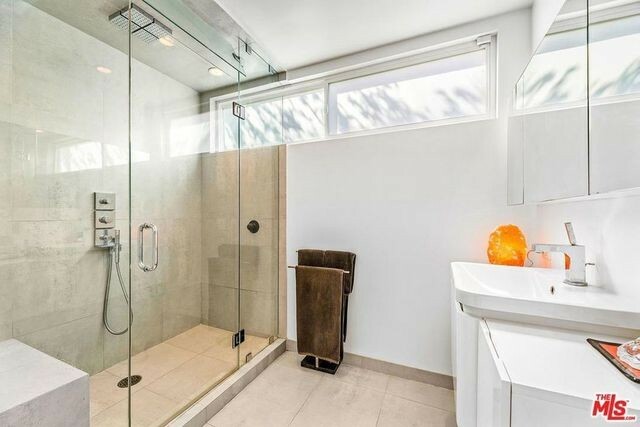 The interior had already been renovated and restored, with updated features like a steam shower and heated floors in the master bath. But the focal point of the home—the living room’s grand stone fireplace—has been left intact. 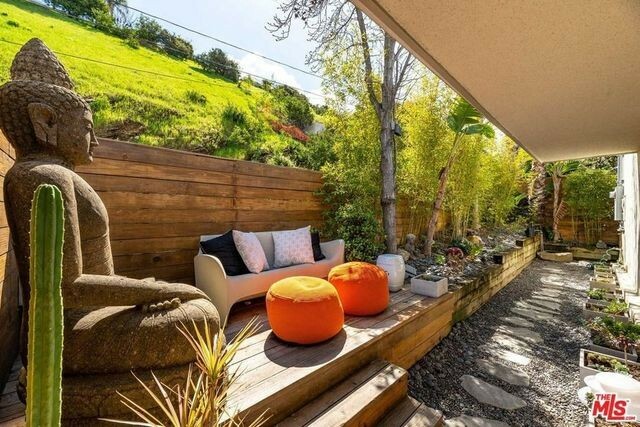 This stilt house sits on a half-acre lot and, as you can imagine, much of it is steeply sloped—there’s obviously no backyard. 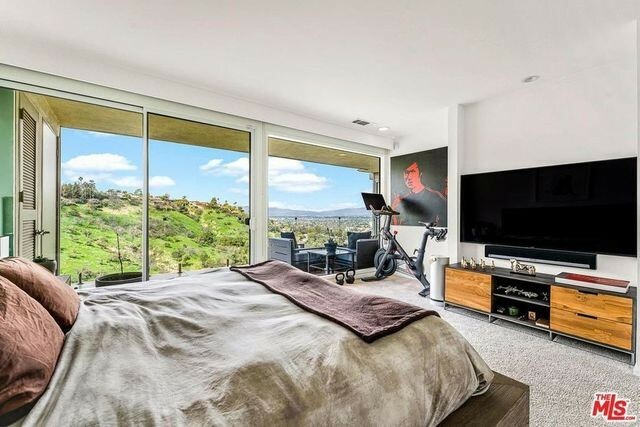 But every inch of land surrounding the home, in front and on the sides, is curated with features meant to capitalize on the Southern California climate. 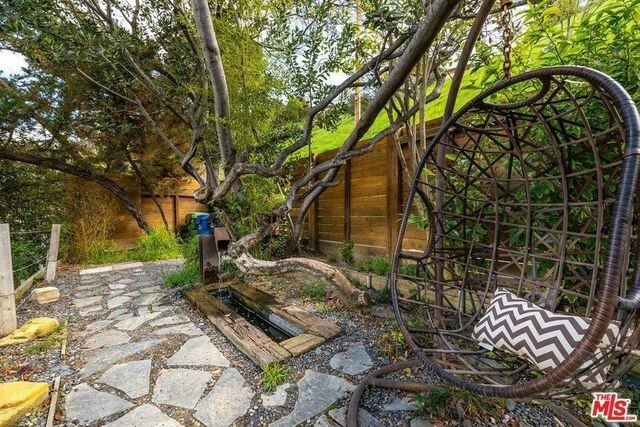 There’s a Zen garden, comfy lounge areas, a fountain, a hanging basket chair, and more—all behind a very private fence.